She's Fantastic: Teenage Mutant Ninja Turtles VIRAL! Teenage Mutant Ninja Turtles VIRAL! The Teenage Mutant Ninja Turtles have gone through many transformations over the years. Then the animated series that aired from 2003-2007 really complicated things by having multiple sub-series' within the main title. 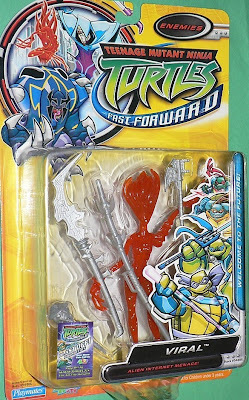 The 2006 season of this show was titled Fast-Forward and featured the Turtles in the year 2105. The thing I liked most about this story arc was the interesting villains that were introduced. 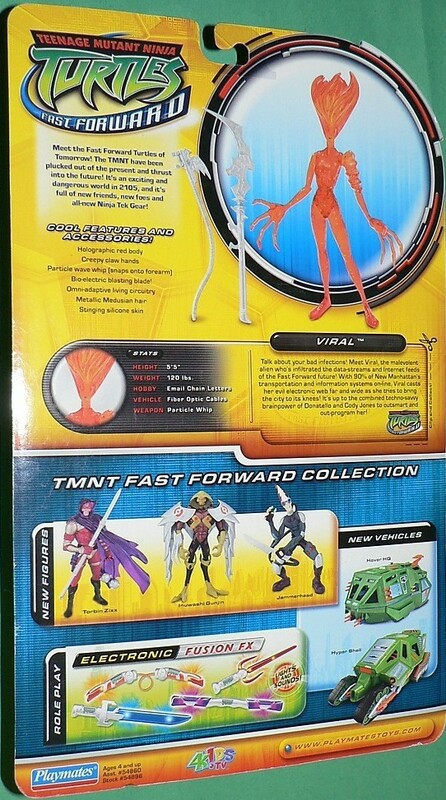 The standout for me was Viral, a living computer virus and totally wicked nemesis to the Turtles. 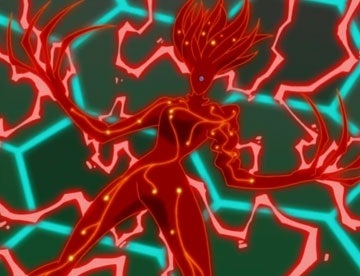 She often took the form of different techno-organic beasts (giant insects, water serpents, etc) but they always looked like her.. ie reddish orange alien-like forms with a single blue eye. Viral was so powerful in this future NYC because of the incorporation of virtual reality environments into everyday life. The setting is also interested because the human population is also now intermingled with many different anthropomorphic species, so the turtles don't need to hide or don disguises. Cool :) Let's check her out! 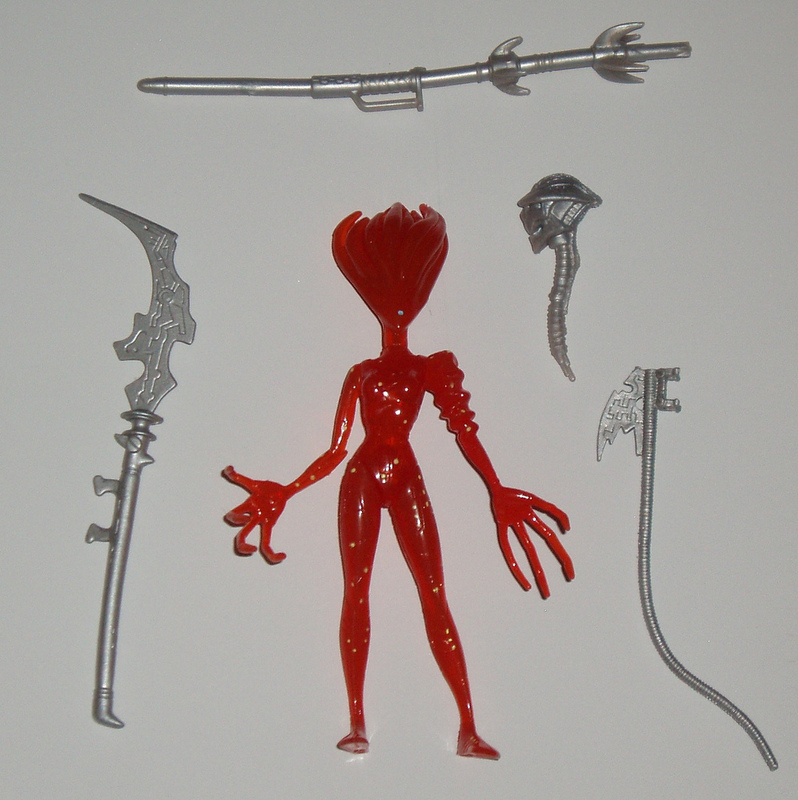 This figure is cast in a translucent plastic that looks great. She has tons of sculpted details all over her body which unfortunately don't show up well in photographs. Viral only has five points of articulation: arms, legs, and neck. Shes came with a lot of accessories, but unfortunately I picked up my figure loose. 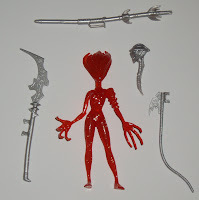 Here are two images I found on the web showing her various silver accessories. 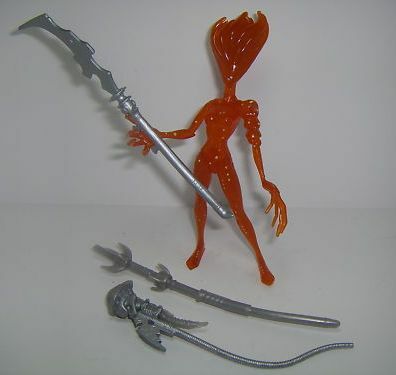 I don't mind not having them because they don't really fit the character (in my opinion -- I wish she came with translucent bugs, or snakes, or energy blasts), and I love the sculpts of her hands which would be obscured with any weapons. Here is a clip from the show (a cool fight scene begins at 5:00:00) and an image of her cartoon look. An interesting thing happened when I tried to buy this figure about 5 years ago. It was on clearance at TRU for about $3 and I decided to grab it on a whim. They had a few in stock. When I was at the register, it rang up as a recalled item and they wouldn't let me purchase it. I went to another TRU a week later and the same thing happened. Within a few days of that second attempt they disappeared completely. 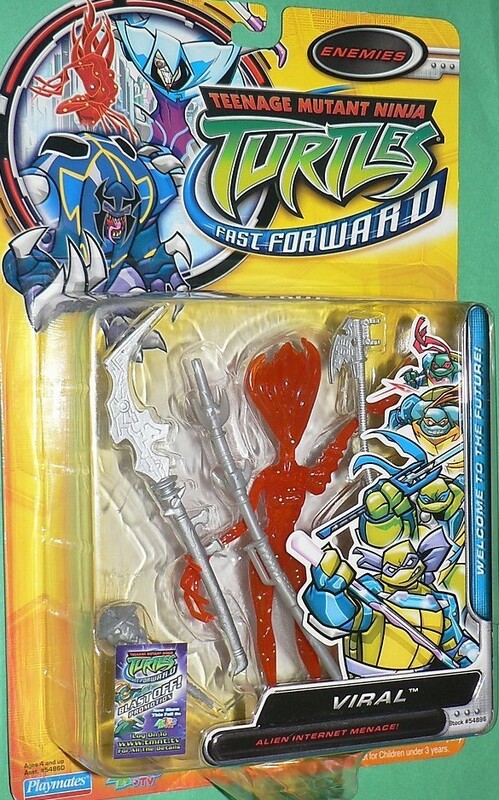 I eventually got a loose one on ebay, but I never did figure out if it was actually recalled or not. My google searches right now didn't find anything either. I'm guessing it was a typographical error in their system. An odd (and embarrassing) thing about this figure is that the plastic is a magnet for dust. She has a fuzzy halo in most of these photos that I didn't realize was there when I was taking them. I've noticed that old DC Direct capes are the same way.